One with Nature - It was important to the Beardens to leave as many mature trees standing as possible, so architect Rob Carlton designed the home to be cantilevered above the ground and set back off the road, utilizing bridges to access the entrance and garage. Sandra and Barry Bearden, pictured with pup Lindy. Inviting Space - Douglas fir ceilings, doors, and windows, cypress and walnut walls, and recycled center-cut heart pine floors bring warmth throughout, but particularly to the open kitchen and dining area. An iridescent glass tile backsplash adds contemporary shine. Fireside Chat - The living room is luxurious, with a leathered granite fireplace and a customized Edward Fields rug, which incorporates Sandra’s favorite color: purple. Natural Sanctuary - The master suite is comprised of the bedroom, with floor-to-ceiling windows, ample closet space, and a beautiful bathroom with his and her sinks, a tile shower, dry sauna, and window-facing soaking tub. The sounds of rain and acorns plodding on the metal roof, the cross-breezes drifting through the open windows—the sights and sounds of the home make living here a sensory experience. The bathroom with his and her sinks, a tile shower, dry sauna, and window-facing soaking tub. Sky-High Views - Two sets of French doors allow easy flow between the dining, kitchen,and living areas and the 40-foot deck. A small porch off the master suite, a screened porch attached to the dining room, a covered stone patio, and another deck off the guest suite offer more private spaces to sit outside and take in the sunset vistas. Perfectly Uplifting - Sandra and Barry Bearden (pictured with pup Lindy) chose to build at Mountain Air because of the elevation, offering cooler temps and jaw-dropping views. On a July day in 2006, Barry and Sandra Bearden arrived in Upstate South Carolina looking for a second home that would allow them a retreat from the Texas heat. Finding more of the same sizzling temperatures, they decided to take a look at a place Barry had spotted in an airplane magazine: the Mountain Air community near Burnsville, about 100 miles north and 20 degrees cooler than where they started. By the end of the weekend, they’d bought a condo. 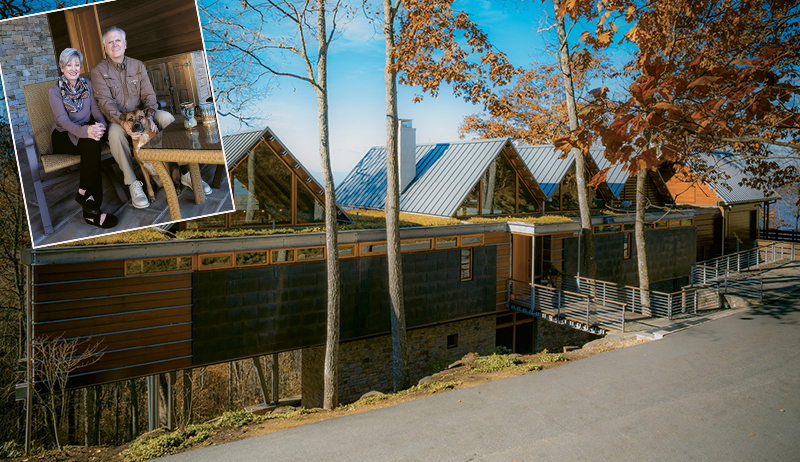 Three years later, they’d embarked on a project to build one of Mountain Air’s most unique homes. Cantilevered on the side of the mountain to take full advantage of the spectacular Blue Ridge views, the Beardens’ 3,400-square-foot home, completed in 2012, was thoughtfully designed by Rob Carlton of Carlton-Edwards Architecture to use space effectively and efficiently. Too many second homes have downstairs space that’s never used, Sandra says, and the couple wanted to avoid that. The cantilevered design allows for a home that’s essentially one room deep, with each room taking advantage of the breathtaking view as well as the outdoor space that’s integrated into the home and used daily. The private guest suite, located under the garage, allows visitors to have autonomy, coming and going independently without having to enter the main house. It has its own private patio surrounded by trees but also long-range views. Building on the side of a mountain is a challenge. But despite the 100-plus mile per hour winds that sometimes buffet the house, “it’s not going anywhere,” says Barry. The base, “like a concrete vault,” was set into the rock on the side of the mountain, and the couple took no shortcuts to safeguard the home. Using steel i-beams, the frame was constructed to ensure exact placement of bolts, then deconstructed so that the beams could be galvanized, then reconstructed again. The galvanizing protects the longevity of the beams and drilling points, which could weaken if rusted. The copper siding panels on the dwelling’s front exterior were pre-patinated to make sure that the effects of weathering would be uniform and not left to chance. Cedar exterior paneling contributes to an overall effect that’s contemporary but in harmony with the landscape. Making the house as eco-friendly as possible was a priority for the couple. The green roof is planted with sedum and maintained by Asheville’s Living Roofs, Inc. The home is heated by geothermal energy, although there’s also a gas fireplace with a leatherized granite surround. Designed to be cooled without air-conditioning, the home’s interior features casement windows were located near the floor and ceiling for maximum air flow and cross ventilation. The double-pane windows keep the home energy efficient. Retractable shades offer both privacy and sun-protection. All this attention to detail earned the home a silver certification from North Carolina Healthy Built Homes. Because of Mountain Air’s remote location, many residents entertain at home rather than making the trek into Burnsville, and the Beardens are no exception. “Entertaining here is wonderful,” Sandra says. She worked with Houston-based decorator Tony Raffa to source, among other things, tiles for the bathroom and kitchen and the Poggenpohl cabinets. Sandra chose the colors of the Edward Fields rug in the living room, incorporating eggplant—one of her favorite colors—which is echoed in the leather-upholstered dining chairs. “So many mountain homes are done in shades of green and brown, so I wanted something different,” she says. The dining table consists of an i-beam left over from the home’s construction and a wood slab found in Spruce Pine, constructed and finished by the home’s builder, Russ Robison. The couple’s two office desks were constructed in the same way. Asheville’s Architectural Woodcraft built the windows and doors, plus there are custom local touches, such as the hand-forged front door handle. To give the interior depth and texture without paint and drywall, different types of woods were used for the paneling, including Douglas fir, cypress, and walnut. Recycled heart pine was used for the flooring. The work of local artists can be found throughout the home, including Sandra’s favorite piece, a ceramic wall hanging by Jeannine Marchand. While the home is overall contemporary, there are a few antique touches around the house, including a lamp that belonged to Sandra’s parents and a Coca-Cola fridge on the grilling porch. The Beardens spent their working careers in Houston, but now split their time between the Mountain Air house and a home in the Texas Hill Country, where Barry enjoys hunting and fishing. The ambience at their Texas abode, says Sandra, is more rustic: think leather upholstery and antler chandeliers. While that suits their life there, the tree house-feel of their Mountain Air home allows them to have the best of both worlds. From the expansive deck—where they eat dinner almost every night—they are treated to incredible sunsets and sometimes a surprising nature encounter, such as the sight of a mama bear and cubs tracking through the property at the base of their home. The sounds of rain and acorns plodding on the metal roof, the cross-breezes drifting through the open windows—the sights and sounds of the home make living here a sensory experience. In harmony with nature but elegant and comfortable, the Beardens’ home on the mountain is truly a breath of fresh air.